Packed full of miniatures and high quality cardboard, Fantasy Flight games have long topped my list of things to drool on when visiting my local comic shop. Their latest offering is sure to grab the attention of our chainsaw wielding brethren still battling the Locust menace. 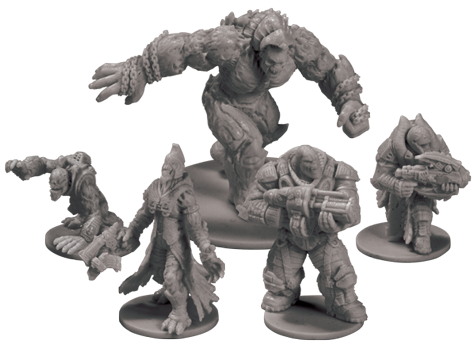 Gears of War: The Board Game is packed full of goodies like plastic figures (over 30! ), nearly 250 cards, and 17 double sided map tiles. In a unique twist, this game features a co-operative system where up to 4 players face off against the game’s card based “AI” system in 7 randomized scenarios. All of your favorite moves from the video game are represented, such as the Roadie Run or blind firing from cover. There is even an optional rule set for playing Horde Mode! Fantasy Flight has been kind enough to post the rule book online and released an overview video. Gears of War: The Board Game is on sale right now. Be sure to give that box a good sniff for me! Mmmm… That’s one thing that digital distribution just can’t offer.